Photo: Steve Attwood. Pūteketeke – Australasian Crested Grebe – Podiceps cristatus. I was only two-years-old when my parents bought an old ‘smoko hut’ from the Geraldine Linen Flax Mill and transported it to Te Puna a Taka (Lake Clearwater) – part of the Ō Tū Wharekai wetland system in the Ashburton lakes/upper Rangitata River area, now part of the Hakatere Conservation Park – there to be converted into a family bach. Perhaps it was a predictive omen that my first vivid memory of ‘the hut’ was of a single-roomed wooden building liberally splattered on the inside with the guano, old nests and dead bodies of many dozens of starlings that had previously made the building their home. It was not the starlings, however, that were to capture my imagination at Lake Clearwater, it was the puteketeke (Australasian Crested Grebe – Podiceps cristatus). The Ashburton Lakes were, and remain, a haven for this beautiful bird and for me they were the stand-out wildlife of the area. They became the icon of decades of idyllic summers fishing, swimming, tramping, bunny shooting and bird watching throughout this utterly beautiful landscape. In those early days cattle grazed up to their bellies in the red tussock wetlands at the head of the lake and they, along with sheep and rabbits, had pretty much reduced the surrounding hills to sparse fields of mouse-eared hawkweed, stunted tussocks, a few hardy alpine shrubs and herbs, and the ubiquitous spear grass. Nevertheless, it was a majestic landscape and a great place for a boy to live the life of Tom Sawyer, free to adventure at will. The birds, for me, were always more fascinating than trout. My rod would be laid down willingly when grebes or huge flocks of New Zealand scaup floated by, or black-fronted tern darted overhead. The summer pastures were places for a boy to find nesting SIPO and, in the riverbeds, banded dotterel and wrybill. Marsh crake and bittern were heard in the swamps at night, and harriers were a constant in the burning blue summer skies. Falcon were regularly seen, and little shag nested in the tall pines on island. I would spend hours floating on my lilo, or in a canoe, watching them, especially the grebes. Puteketeke were popular with the fly fishers too. The baches are located on a ribbon of land between the larger Lake Clearwater and the smaller Lake Camp. Apparently, the reason power boats were confined to Camp was because of the danger of powerboat wake to the grebe’s floating nests on Clearwater. It’s my earliest recollection of something being done for ‘conservation’ reasons. Then, as now, there was a pair of grebes that always nested in semi-submerged willow right on the foreshore where the motor camp was, and still is. I’m assuming not the same pair all this time, but clearly the site is a valuable one as I cannot recall a season when there wasn’t a nest there. The others pretty much all nested among the willows leaning into the water from the island or attached floating nests among the semi-submerged swamp tussocks. I got my first camera when I was aged seven and learned the bitter lesson that a second-hand box brownie did not deliver satisfactory results when aimed at birds out on the lake. My early photos were dominated by scenes of distant silhouetted birds in a watery landscape. My growing up at the lakes coincided with the growing up of the conservation movement in New Zealand. 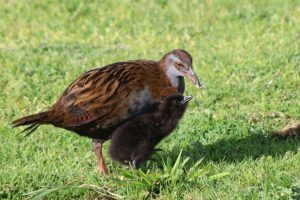 Eventually, the Ashburton Lakes were to become part of Hakatere Conservation Park protecting, among other things, some of the best kettlehole landscape and red tussock wetland in New Zealand. The degree of recovery of the landscape since that protection is nothing short of amazing. The snow tussock has returned in force; alpine hebes and other shrubs are flourishing; delicate snow berries, vegetable sheep, lichens, mosses and other ground covers have re-clothed the rabbit-scarred fields. Lizards, butterflies, grasshoppers, weta, crickets and other insects are now abundant. The birds are recovering too, though the numbers of grebes remain comparatively low on Clearwater. Which all points to why this photo is my favourite. 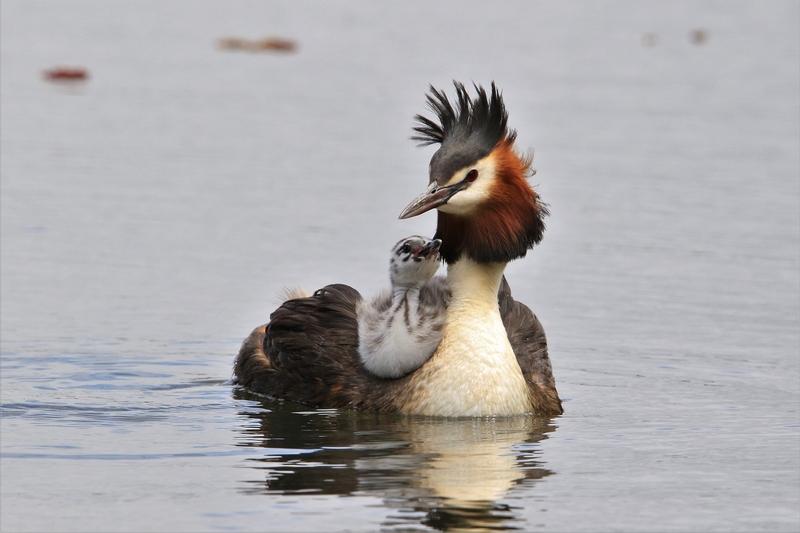 This female grebe with her chick symbolises the whole story of a precious montane and wetland landscape that has flourished under conservation protection. There is, at the risk of anthropomorphising, a confidence in the pose of the mother and the presence of the chick symbolises hope to me; hope for a better future for this incredibly beautiful and important landscape, and the plants and creatures that live in it. By Steve Attwood. Steve has been a conservationist most of his life. He has developed his special passion for bird photography during the past 15 years. He lives in Little River, Banks Peninsula. Hibernating fish comes to life!